Click on the Porsche crest to go to Porsche Cars North America. The car was sold on Ebay Motors for $10,100.00 on July 25, 2008. The buyer is located in Germany. See the eBay pictures here. 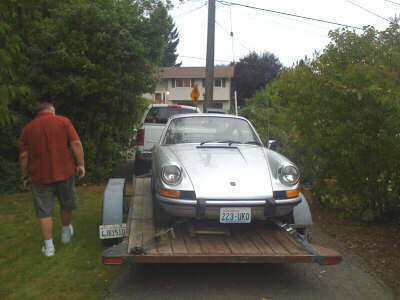 In 1973 I traded der Alte, my 356C, in on a new silver 911T. This car was retired from service in 1990 when I finally got tired of the hassle of getting it licensed after it failed the emissions test. After that, the car sat sadly idle in the garage. For some years I had entertained the fantasy that it would be fun and easy to convert the 911 to electric power. In 1992 I did a little research into the possibilities. This included scanning the car magazines and, in the December issue of Kit Car Illustrated, I found an advertisement for the Electro Automotive company. I wrote for their catalog. Bingo! The Electro Automotive catalog contained all sorts of electric car stuff. Big DC motors. Motor controllers. Battery chargers. Gauges. Battery maintenance supplies. Books. Videos. And kits. There was a bolt-in kit for the Volkswagen Rabbit that required no design or fabrication. There were generic kits that included all of the essential components needed for a conversion including the adapter that couples the electric motor to the transmission. Eventually, I ordered a generic conversion kit from Electro Automotive. The kit included a book called Convert It by Mike Brown with Shari Prange which describes the conversion process step by step and includes many useful tips. As it turns out, Mike Brown is the proprietor of Electro Automotive. He is an authority on electric conversions with more than 30 years of professional automobile experience and over 17 years of professional conversion experience. You can write Electro Automotive at P.O. Box 1113, Felton, CA 95018 or call them at 408-429-1989. Not included with the kit are the batteries and, except for the motor adapter, the vehicle specific parts such as the battery boxes and racks, motor mounts and so forth. These I had to make myself. No problem, I thought. I'm mechanically inclined. It would all be a grand adventure. In retrospect, it was an adventure and a great deal of fun but, for a practical electric conversion, there are better choices than a 911. WARNING! If you are a dedicated Porsche fan, the story that unfolds in the following pages may be deeply disturbing. In fact, in Stuttgart, I would probably be up on charges of desecration. But this is America where any nut can pursue his warped dream with carefree abandon.